Toronto the Good is back, ushering in a new season at a new venue! 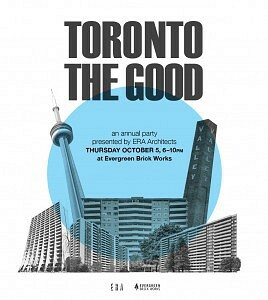 It is an annual party presented by ERA Architects (and friends) to celebrate the city of Toronto, and contemplate its history and evolution with fellow architects, designers, and urban-minded people. For this instalment of our annual party we are supporting the initiatives of the Tower Renewal Partnership, an initiative working to preserve and enhance mid-century apartment tower neighbourhoods through research, advocacy and demonstration. International experts and local city-builders will be meeting at a symposium during the day to explore innovative strategies for transitioning these aging apartment tower neighbourhoods to meet the demands of our 21st century cities. Now is the time for coordinated action to build a future around more complete, resilient, and affordable cities. Tower Renewal is a strategy for realizing this change. We hope you will join us at the Evergreen Brick Works on October 5th, 2017, in celebration of the Tower Renewal Partnership’s accomplishments at this year’s event. Join us for hors d’ourves, cash bar, and a lively crowd of people passionate about design and civic engagement in Toronto. Admission is free, but registration is required for entry into the party. Join us at 5:30pm for a keynote by author and journalist Doug Saunders. Shuttle buses will be running between Broadview Station and the Evergreen Brick Works throughout the duration of the event. When: Thursday, October 5th, 2017, 6:00 – 10:00pm. Click here for more information on the Tower Renewal Partnership and its work.